Dragon1 is your Integration Hub. EA and ITSM are often two disconnected worlds. Dragon1 integrates them! If you have data in different systems and want to report relationships or impact of change between these data, Dragon1 is a solution that works. On the visualization below, you can see an integration scenario and read how it works in detail. An organization, for instance, Apple, is present worldwide and has offices in major cities around the world. These offices work together via the internet. The data of strategy, processes, applications and servers are stored in four different major systems or databases. The organization lacks real-time visualizations that show the impact if servers crashed or if there is a data breach or what the options are for quick technology adoption. 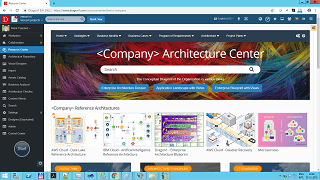 The architects at the company work as hard as they can and use Excel, PowerPoint, Visio and a free ArchiMate Tool without repository to create insights and overviews of architecture. How hard the architects work and how experienced they are, they are limited by the means they use. 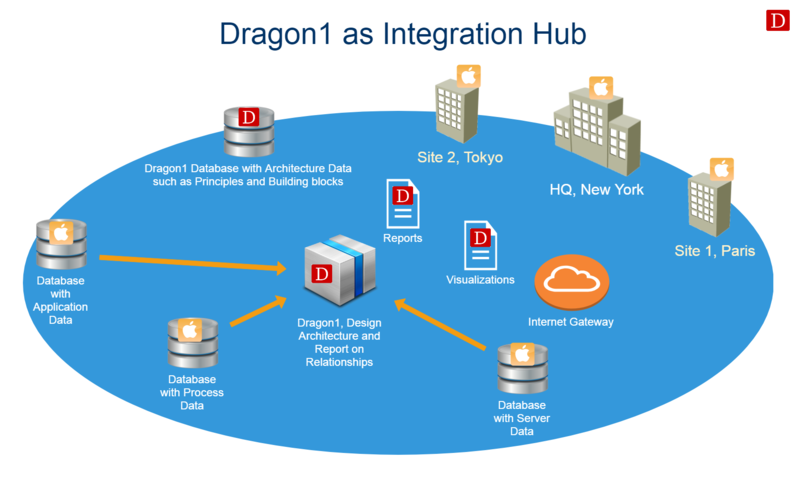 Dragon1 provides a solution of integration the IT Service Management data of the company and combine it with Enterprise Architecture data. Dragon1 enables for this organization the generation of reports and architecture visualizations that before were hard or even impossible to make. 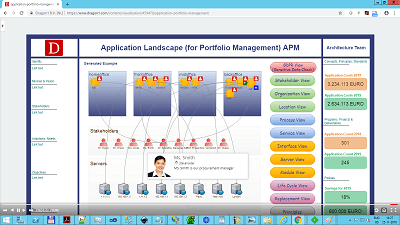 Dragon1 is unique in reporting and visualizing the usage of Architecture Principles in your process, application and IT landscape. The benefits of integration are huge. For instance, you can report on the relationship between data that was not related before. The relationships can be created on Dragon1. You can report or generate visualizations on potential fraud in processes or where your security is ready for improvement. At an architecture level you can report for the current state (AS-IS) which architecture principles you are using in your process landscape, application landscape, data landscape and IT landscape. Probably you now will your special benefit in mind. 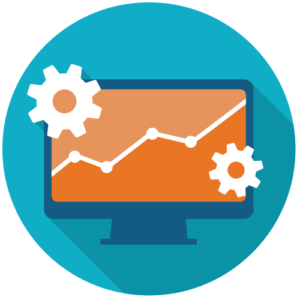 EAI was a long thought promise of IT: integrating all enterprise architecture and making maximum reuse of data inside the applications. Today techniques and technologies like XML, REST API and GraphQL, this has become possible. Your organization to can enjoy EAI to the max, by using Dragon1.